This soothing and moisturizing After-Sun Lotion provides the skin with long-lasting hydration. The non-greasy and quick-absorbing formula counteracts the drying effects of the sun while providing a cooling effect to the skin. 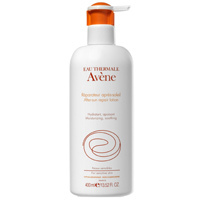 Avene After-Sun Repair Lotion is hypoallergenic, non-comedogenic and recommended for those with sensitive skin.